Homepage. This page: Up for sale in the late 1940s, a special dispenser for motor-car oil. With the war out of the way, the larger garages started to plan how they'd be able to cater for the post-war motorist, most of whom were having to dust down their pre-war steeds, the supply of new vehicles being all-but non-existent to the general populus. The export drive that was in full swing at the time, so despite new cars being on show at Earl's Court in 1948 and 1949, opportunities to actually get your hands on one were few and far between. The re-awakening therefore of many creaky pre-war motorcars, many already in fairly parlous state of repair before being laid up, meant that the services of a trusty local garage were often in high demand. Servicing and general re-commissioning work was a frequent request, whether it be on a plodding old Austin or Ford, or something more luxurious, such as the late '30s Humber Snipe shown below. 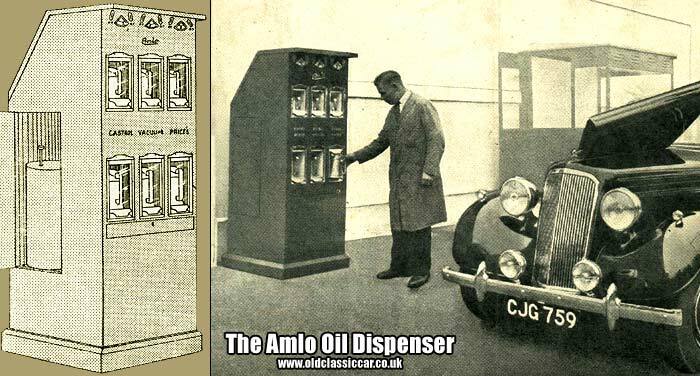 The AMLO oil dispenser shown here was just one of many inventions pitched at garage owners, designed to make the job of car servicing on a commercial scale, that bit slicker. Tanks built into the back of the unit keep the oil clean, until such time as it was required. The supply of oil was both measured and regulated, thanks to the use of tokens that the mechanic would insert into the dispenser. Three different blends or makes of oil could be stored within the AMLO. Six oil jugs sat behind clear shutters, two per choice of oil. The shutter(s) could only be opened once a token had been inserted. The tokens used would be marked up with the operator's own identifying number, enabling the quantity of oil dispensed to be matched up to the job(s) done by that mechanic on the given day. Exact amounts of oil, either by quart or pint, would be dispensed into the oil jugs. As soon as the jug had been replaced, and the shutter closed down again, the jug would be re-filled, ready for the next request. A slide-out drawer beneath the lower three jugs contained the used tokens, each in it's own compartment, allowing the garage owner to accurately track the usage, and popularity, of the different oils on offer. This efficient system was also designed to stop any pilfering of oil by either less scrupulous mechanics, or else passing motorists who needed a quick top-up. Three gauges at the top of the AMLO monitored the quantity of oils remaining, with a maximum of 12 gallons stored for each of the three lubricants being dispensed. Are there any of these still in operation anywhere, or tucked away gathering dust in the back of an old-style garage? Return to my motoring gadgets, tools & accessories pages at oldclassiccar. Included is a look at the innovative "Swing-Spout" oil measure and pourer, designed and built in the USA (link).